The expert team of the industry publication 4×4 Australia tested seven models of all-terrain tires to find out which one of them, in the size of 255/65 R17, deserves to be called «all-terrain» most of all. The specifics of the Australian continent impose special requirements on all-terrain tires: not only do they have to be strong enough to deal with daily operation of heavily loaded SUVs and pickup trucks, but they also have to stop and corner confidently on wet and dry bitumen, have to provide enough traction in mud, sand, snow and gravel, and, last but not least, they have to go the distance, resisting punctures over some of the harshest terrain in the world. 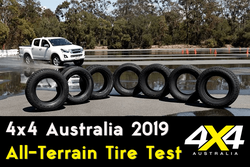 The 4×4 Australia 2019 all-terrain tire test was carried out in Queensland at the Mount Cotton Training Centre. The focus was on seven aftermarket 17-inch all-terrain tires, a popular configuration suitable for everything from compact SUVs to hefty pickup trucks. How the 4×4 Australia 2019 all-terrain tire test was organized. The test car was Isuzu D-Max LS-U, popular in Australia, complete with 17-inch alloy wheels. The tests involved dry and wet braking, dry and wet cornering, as well as an off-road loop that helped evaluate the tires’ performance outside of the «comfort zone» of paved roads. For each discipline a tire was given a score out of 100, with the best getting the maximum score and others ranked according to how far they were from the winner. The off-road performance was evaluated subjectively (the tires were tested on a mix of gravel, mud and rocks). If the pilot was happy with the tire after the off-road loop it would get an off-road gain in the form of a five percent boost to the total of scores. If the driving expert did not like the tire’s performance it would lose 5%. None of the drivers knew which tire he was driving, only relying on the feel, grip and attitude of the car. The price of the tire also was taken into account. Interestingly, what was not tested was resistance to puncture and resistance to wear even though these two parameters are crucial for SUV tires. The test also didn’t involve measuring the tires’ rolling resistance, which, as is known, can significantly affect fuel consumption. The more aggressive character of all-terrain tires means they tend to resist rolling more, which in turn requires more fuel input to keep the wheels spinning. Good and sometimes outstanding performance made Maxxis 700 Bravo AT the winner of the test. It proved itself as a great all-terrain tire sold at a compelling price. Falken Wildpeak AT did not score maximum in any of the disciplines but in each of them it delivered quite a decent performance, which brought this model the second place in the final ranking. The third place was scored by Bridgestone Dueler AT (LT) that was a little weak in the wet but made up for this shortcoming by great performance on dry pavement and confident off-road behavior. This model shared the fourth place at the winner pedestal with Hankook Dynapro AT-M, whose wet road performance was better than its rivals’ and whose wet cornering was a highlight. Dunlop Grandtrek AT25 outdid its rivals in terms of dry and wet braking but its relatively high price and the fact that this tire was ultimately more «city and suburbs» than «all-terrain» could not pass unnoticed — the fifth place. Nexen Roadian AT, the most affordable all-terrain tire on test 2019, came the sixth. As the test experts stressed, this tire is a fine example of «you get money’s worth» mantra. This was the only tire on test that was not awarded (or was fined) for unconvincing off-road performance. The Goodyear brand, which is often associated with Wrangler off-road tires, this time was left on the sidelines. Even though the «All Terrain Adventure» tag added to the main name may signify the off-road character of Goodyear Wrangler AT Adventure, as well as explain the whopping price of 339 dollars, as it turned out, this tire showed the poorest performance in terms of safe highway driving. The last place. The differences between 16, 17 and 18 inch WINTER tyres tested and explained!